When the Winchester and Portsmouth Guild held their dinner earlier in the year at Southampton the Bishops of Winchester and Southampton attended. Mr. Gordon Benfield proposed the toast of "The Church" and Canon Sanders (Overton) replied, whilst Mr. W. B. Cartwright (Worcestershire Association) gave that of "The Guild," to which Mr. Roger Savory (master) responded. The health of the visitors was in the hands of Mr. Kenneth Croft, Mr. David House replying. 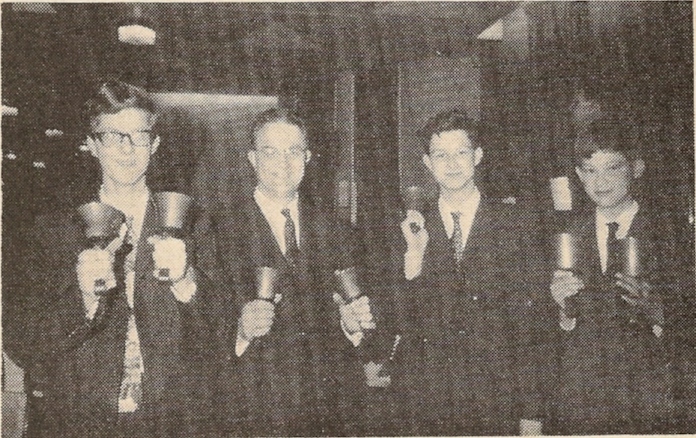 During the evening a course of Kent Treble Bob Major on handbells was rung by (l. to r.) John, Kenneth, James and William Croft - father and three sons.